I try to observe Meatless Mondays, and for the most part am pretty good. Except for holiday weekends when the fact that it’s Monday doesn’t even register. To make up for it, we generally have Meatless Tuesdays. Tofu Tuesdays? The alliteration means everything. 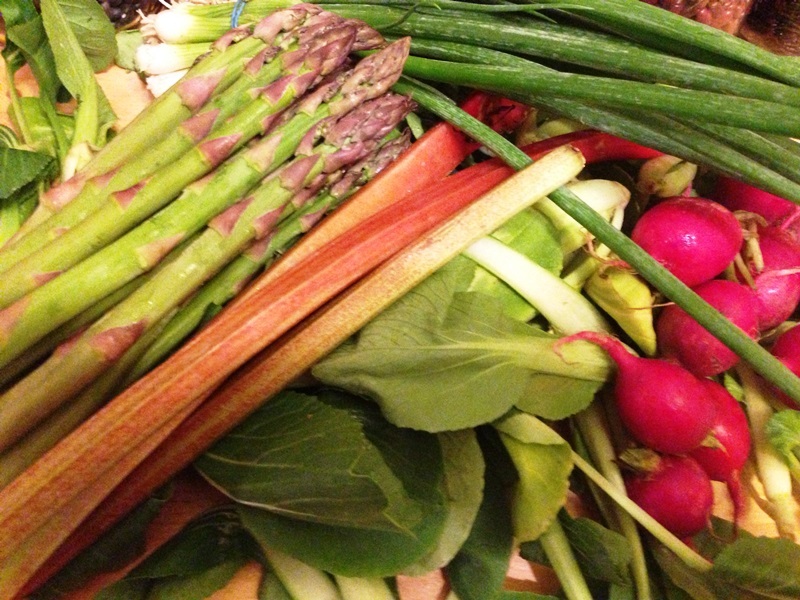 I opened my fridge last Monday to find some radishes, asparagus, scallions, bok choy and some leftover roasted garlic scapes. Quite an eclectic sampling, but easily a meal. 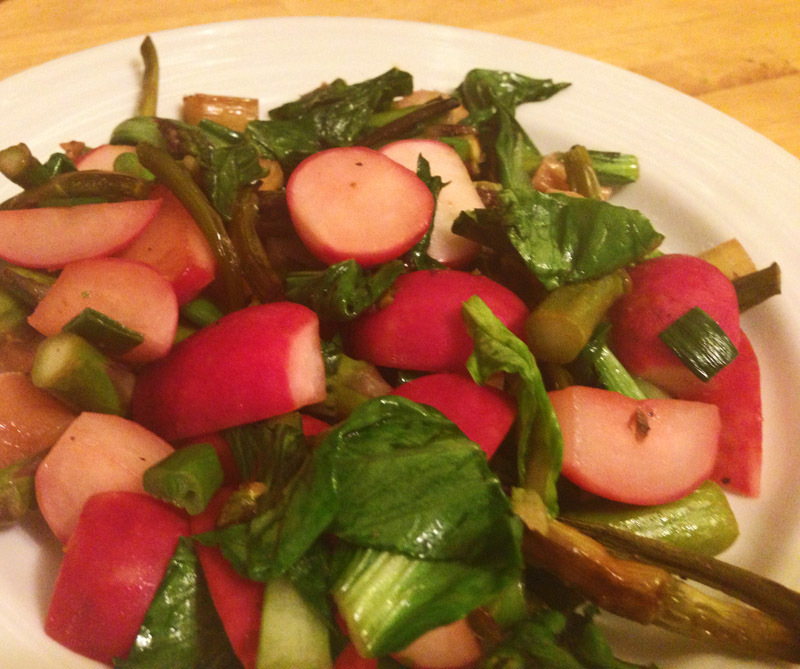 After my first success with sautéed radishes, I was ready to try again. I barely cooked everything, adding the firmest ingredients first and the bok choy last. A simple saute with some white balsamic for acid. The original dish included some rhubarb, though after careful observation (read: tasting) it was determined not to be complimentary to the other ingredients. Perhaps if it was sweetened and roasted first, but plain it was far too bitter. The meal was perfect for us as is, but would also be great served over white rice. As leftovers you could serve it room temp, slightly warmed or right out of the fridge. Heat olive oil in a large sauté pan until warm. 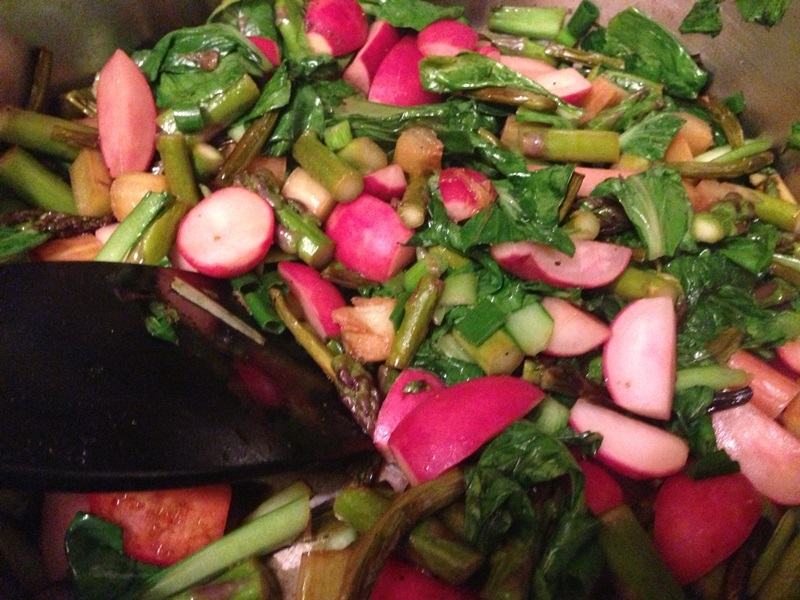 Add asparagus and radishes and cook for a few minutes until browned and slightly softened. Add vinegar and continue cooking until almost evaporated. Add bok choy and roasted garlic scapes and saute until bok choy starts to wilt. Remove from heat and stir in scallions. Season with salt, pepper and additional vinegar as desired. Thank you! I’m sure it would work well with other scraps too–fava beans, broccoli, squash, spinach, etc. Seems like a great idea! Asparagus time is already winding down here, how about for y’all? I feel like it should be winding down, but there was plenty at the market on Saturday. Maybe another week or two.